Yogi Nuden Dorje Chang: tutor of a 1,000 princes who, countless ages ago during the aeon of the Buddha Pranidhanaraja, vowed to appear as Sugata Möpa Ö Tayé (Skt. Adhimukta), the 1,000th and last buddha of this Fortunate Aeon. Drum Khar Nagpopa: Khampa yogin who meditated in dark retreat for 18 years. Hewa Chojung: Khampa magician and subjugator of enemies of the Dharma. 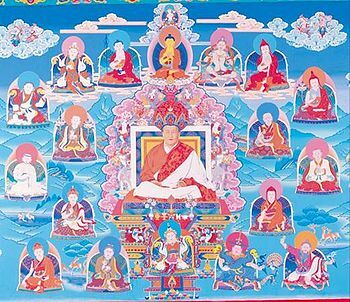 Katok Gyalse Sönam Deutsen (1679-1723): as head of Kathok Monastery, he restored and preserved the tradition of the monastery. This page was last edited on 23 September 2018, at 21:40.